In 2011, film-maker Tristan Stoch followed a team of Acupuncture Relief Project volunteer practitioners during their stay at the Vajra Varahi Clinic in Chapagaon, Nepal. In this short film he successfully illustrates many of the complexities of providing primary medical care in a third world environment. Since 2008 Acupuncture Relief Project has provided over 100,000 treatments to patients living in rural villages outside of Kathmandu Nepal. Acupuncture offers an inexpensive, sustainable method of providing communities access to medical evaluation and basic care. 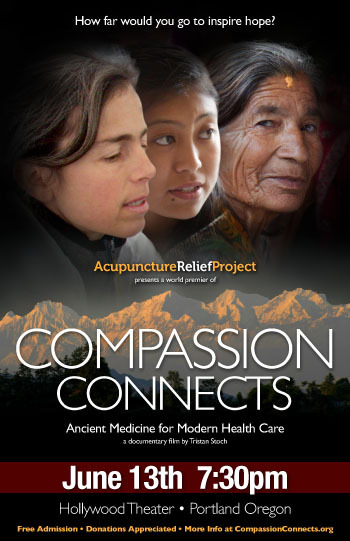 Please join us Wednesday, June 13th for a celebration of Acupuncture Relief Project’s work in Nepal. Between the two screenings of the film, Project Director Andrew Schlabach will give a brief talk about the organization’s accomplishments. Against tremendous obstacles of poverty, in regions where the struggle to survive often usurp basic medical needs, five volunteer acupuncturists, set up a health clinic in Nepal. Through providing basic primary health care, a connection emerges between patient and practitioner that act as a vehicle for exploring fundamental questions about what it means have compassion, and elementarily, what it means to be a good human being. These relationships have long-lasting effects both personally and socially, bringing waves of compassion to all communities, at home and in Nepal, creating meaning, changing lives, changing communities. Click here to watch the Compassion Connects theatrical trailer: How far would your go to inspire hope? Dr Sami David is a reproductive endocrinologist who has been working with Jill Blakeway, LAc for several years. Dr. David discusses concerns about IVF and why acupuncture and Traditional Chinese Medicine are a healthier alternative to fertility drugs. Jill Blakeway explains the types of people who come in for treatment, and how they have come up with a way to find the "type" of people who come in for treatments. Jill gives specific advice about each type, and explains that in Chinese medicine, we treat each person individually. Each type and each person will have specific treatment plans tailored exactly to what they need. Jill also reminds couples that it's not always the woman who may be the reason a couple is unable to conceive, and that men should also get checked out. If you are curious about your "type" go to the Making Babies Program website and take the test (I took it- it's easy!). I also recommend checking out the YinOva blog for a great post on how men can boost their fertility potential. This weekend, I attended the 2009 Symposiun for Portland Area Research on Complementary and Alternative Medicine (SPARC). SPARC is a yearly event where all Complementary and Alternative medicine come together to listen to new research presentations, view posters, and discuss research in the field of alternative medicine. The Helfgott Research Institute is the organizer of this event - you can check out their blog here. Dr. Josephine Briggs, the director of the National Center for Complementary and Alternative Medicine (NCCAM) gave a great presentation on how alternative medicine is changing in the west, and how it is sought out now compared to several years ago. For example, in a 2007 survey, the top three reasons patients seek acupuncture was for back pain, neck pain, and joint pain. Compare this to a 2002 survey where the common cold was the reason (now it's down around #7!). It's good to see that people are realizing the all-encompassing healing that is Traditional Chinese Medicine, and I can't wait to see what comes up in a future survey. For a list of more research articles, check out Barbican Acupuncture's research page, or Chinese Medicine News. Childrens Hospital is integrating acupuncture into treatment plans for kids! Childrens Hospital Los Angeles is collaborating with the Yo San University of Traditional Chinese Medicine to provide acupuncture and Chinese medicine to pediatric patients. The Pediatric Acupuncture Program began treating patients in January of this year, and Dr. Jeffery Gold, the director of Pedictric Pain management stated that "...acupuncture may serve to harmonize Traditional Western Medicine and Traditional Chinese Medicine as a means of promoting preventive care and symptom management for children." More information on this collaboration can be read here. Childrens Hospital Boston has been utilizing acupuncture to help with chronic pain management as well as diseases such as asthma, constipation, and dental pain. Acupuncture is used in conjuction with Western medical care at the hospital in order to “.... decrease children’s pain and symptoms so that they may participate in activities at school, in sports and with their peers,” reports Dr. Yuan Chi Lin, director of Children's Medical Acupuncture Services . I look forward to seeing how many pediatric hospitals in the US and hopefully throughout the world will be using acupuncture to help children in the future! I came to Portland in 1979 to study at the National College of Naturopathic Medicine, now called the National College of Natural Medicine. I have a part time practice; I practice one day each week. My educational background is in education, and I enjoy teaching. I spend most of my week teaching and doing some administrative work. In my practice, I see patients of all ages with many different problems, from acute illnesses to chronic diseases. With my background in both Naturopathic and Chinese medicine, I combine several different frameworks and modalities in my interactions with patients. 4. Where does your passion for the medicine come from? My passion for medicine in general comes from my desire to help relieve suffering. Suffering can take many guises on many different levels, but that is my goal. Helping people realize optimum health and potential would be the ultimate goal. I am passionate about seeing people change, hopefully in positive ways. I feel that my contribution to my patients and students is to help create a better world in which to live. Moderation, including moderation in moderation! Eat whole organically grown foods as much as possible, including a lot of vegetables and fruits. Drink clean water. Exercise daily. Meditate or do something for relaxation daily. Think good thoughts. Connect with others. Smile as much as possible. 5. What is your favorite restaurant in Portland and why? I have to give you two, Higgins and Alexis. Higgins has exquisitely prepared and tasty food, cooked with local organic ingredients as much as possible in a relaxed, friendly atmosphere. Alexis is a Greek family restaurant that has great food in a family centered environment. Using acupuncture in addition to or instead of anesthesia during surgery is an idea that is nearly unthinkable here in the west. That being said, electroacupuncture is often used in China as surgical anesthesia, as the stimulation is often stronger and easy to adjust the strength of the current. 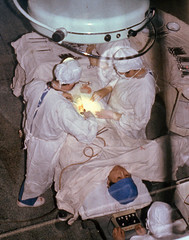 The points that are used are often specific to whatever surgery is being done. Patients who use this method instead of going under general anesthesia often have an easier recovery, which means less nausea and vomiting, no lack of lucidity, and much less drowsiness. It's important that the patient be familiar with acupuncture, and also aware of any possible problems, as they will be awake during the surgery. I think the drug-free method of surgical procedures is a great idea, and a teacher of mine at OCOM took part in an acupuncture anesthesia a few years ago at OHSU. Roger Lore, DAOM assisted with breast reconstruction surgery for a patient who had a mastectomy due to breast cancer. He describes the mood of the patient during the surgery as well has her quick recovery. He describes how the patient was lucid throughout the procedure, and that she was able to get off of the surgery table by herself after the procedure was finished. When the surgery took place at the Oregon Health Sciences University, acupuncture points were used on the arms, feet, scalp, and ears. The patient reported feeling some pain during the surgery, but refused any chemical anesthesia. 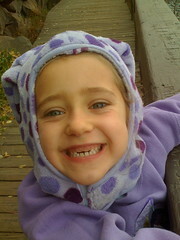 She was very happy with the procedure, and felt much better than after surgeries where general anesthesia had been used. You can read the article written by Dr. Roger Lore online at www.scalpacupuncture.org (scroll down to #6). For another great article that goes into more detail about the use of acupuncture anesthesia in China, check out www.gancao.net. 1. What brought you to Portland? The Oregon College of Oriental Medicine; it’s Traditional Chinese Medicine program AND the research department. Plus I love the all the activities Portland has to offer (surfing to mountain climbing and everything in between). 2. Why did you decide to become an LAc? Drawn to healing arts, I was considering a doctorate of chiropractic medicine or physical therapy, but was swayed to becoming an acupuncturist after receiving treatment for poison ivy. I was blown away by the results that were achieved. Couple that with my experience and training in Okinawan martial arts, I had experience with "ki (Qi)," and it was familiar with me. At first, I was nervous about making a living in this medicine, but I followed my heart (and father’s advice) and took the plunge. 3. Tell me about your practice. We offer treatment for all health care needs, specializing in sports medicine. I am at two locations in Lake Oswego: Mountain Sports Acupuncture (a stand alone clinic in a gym), where there are also other providers including physical therapy, pilates, and massage therapy. I am also at Encompass Chiropractic Health, which is a multidisciplinary clinic that includes an acupuncture, a physician, massage therapy, and chiropractic health. It's a lot of fun, energy and an over all positive experiences! 5. Any advice for patients? "Hara hachi bu" (eat to 80% full), stretch regularly, walk in nature, and use preventative medicine (e.g. TCM) at least on a quarterly basis. 6. What is your favorite Portland restaurant and why? I’ll go with Ya Hala; I eat there at least twice per month (sometimes weekly) and it’s always good…vegan or carnivore you choose. I actually came here to be with the love of my life in 2001. We have been married for almost 3 years and just had our first baby - Lucas - in October of last year. We ended up staying in Portland because of OCOM, which I didn't realize was here until after I moved here. Funny how life is sometimes! I have decided to stay because it is a great area and most of our family lives in the area. In 1996 I had suffered a repetitive motion injury that left me unable to move my neck and was in chronic debilitating pain. I come from a Western medicine family background and so when I finally decided to seek medical attention, I went to my MD first. The pain pills prescribed either make me violently ill or just did not work at all - usually both. So at the encouragement of my then co-workers, I sought out a chiropractor. My first visit with her reduced my pain from a 9/10 to a 3/10 and I could move my head from side to side. This first visit to an alternative care practitioner changed my view of health care for the rest of my life. She took the time to talk with me, to assess my work and life habits contributing to my injury and to educate me on how to do self-care at home. As part of my healing process she encouraged me to understand what was happening in my body and to connect to it. Part of this healing journey included her encouragement/insistence that I finally try that "crazy" thing called Acupuncture. I had always wanted to experience Acupuncture, but I was very nervous. The Acupuncturist also took the time to explain to me what she was doing and why. She was patient and kind and really listened to my story. On one of my visits with her, she told me that while she is not in the practice of telling people what to do with their lives - she felt I wasn't entirely on the right path. She told me that she felt that I wasn't allowing myself to follow in the path I was meant to be on - which was why I was experiencing so many health problems. (I was very ill at the time with many health issues, not just my neck injury). She suggested I consider becoming a health practitioner, not just a health educator (which is what I was doing at the time). To say this conversation changed my life, is an understatement. When she suggested that some of my illness could be a result of my limiting my own potential, I cried because in my heart I knew it was true. I had never had a conversation like this in my life and I really felt that for the first time someone finally believed in my potential to help others. It took another 2-3 years of having conversations with myself before I believed that I was smart enough to become a healer. In that time I had moved to Portland and then decided to start looking at various medical school options and lo and behold - there was OCOM! I let my instincts guide my decisions and followed the flow of what I now think of as Qi and applied to OCOM without any knowledge of Chinese Medicine, other than from the perspective of a patient. In fact, it didn't really hit home that we were going to learn about Chinese herbology until say, the second week of class - bit of a shock to the system when my Shen (mind/soul) finally realized where the Qi had taken me. I think it is rather funny that Chinese herbology has become my primary love and focus in my private practice. Ultimately, when I came to OCOM and started to learn this medicine, I found an inner peace and understanding that I had been craving my entire life and I continue to be inspired by this medicine everyday. I am located in the community of Milwaukie, Oregon and I love this area and the community! I have been working with a wide variety of health issues to date and while I don't feel that I have a specialty, most of my patients are dealing with pain, endocrine system issues (PCOS, Diabetes, etc), cardiovascular health (high blood pressure, high cholesterol), sexual function/infertility, immunity, weight management and mental/emotional issues. Generally speaking I tend to have a gentle and quick acupuncture technique and incorporate different styles of acupuncture like Tan, TCM and Japanese. While 90% of my patients take Chinese herbs, it is certainly not a requirement to have a treatment with me. What I love about my physical space is that it is comfortable and relaxing and best of all, my patients don't have to climb any stairs! 4. Where does your passion for the medicine come from? I have always been curious about the health of our bodies and minds since I was a child. I was also inspired by my mother who studied to become a RN in my teens and is now an Oncology nurse. Yet, when it came time to decide what to do with my life I was greatly confused. I wanted to help people, but something about the Western medical philosophy and medical model just didn't work for me. As I mentioned above, I didn't know there were other options and so I ended up having a triple major in Environmental Studies, Music and Sociology and started a peer sexual health education program on my college campus. When I received my undergraduate degree, I still had no idea what I wanted to do with my life, so I followed my heart and began a career in sexual health education. I love working with people from varying backgrounds and experiences and this career allowed me to do just that. While this was a very rewarding time in my life, I still felt like I was missing something. When my injury led me to my first chiropractor and acupuncturist, I knew my life would never be the same. And it hasn't been - which is a really good thing! I am a happier, healthier and more full-filled person as a result! Now my passion comes from wanting to help other people along their healing journey (as I have been helped) and I feel like I have the experience, knowledge and know-how to do just that. 5. Any advice for patients? There is rarely one finite answer to health related concerns. While it will take work on the part of the practitioner to find the proper diagnosis and treatment, it is ultimately up to you to follow-through on the treatment plan given to you and the lifestyle changes that may be recommended. It is important to ask questions, trust your instincts and utilize all the different medical modalities that our community has to offer, which includes, but is not limited to: Acupuncturists (LAC); Chiropractors (DC); Naturopaths (ND); Medical Doctors (MD); Massage Therapists (LMT); and more. Believe in your ability to improve your quality of life and to live a happier and more full-filled life! I have a few dietary restrictions, so this is a hard one. When I want to eat something good and play by the food sensitivity rules - I love the New Seasons Wok bar. If I am going to break the rules a bit I love Beau Thai in NW Portland, Pastini on Division, Schvonne's on Division. Good food, locally owned businesses and great people! Kendra Ward, LAc of Whole Family Wellness 1. What brought you to Portland? 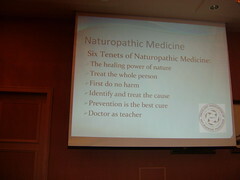 I moved to Portland with my husband so that he could attend the National College of Natural Medicine. In the process of him completing his naturopathic degree (and me creating a practice) we both fell in love with Portland. At this point, we are very settled in and are really enjoying living in such a beautiful city. 2. Why did you decide to become an LAc? My practice is located in SW Portland on the backside of Multnomah Village. My practice used to be named Unbroken Flow Acupuncture, LLC but in the last year it was changed to Whole Family Wellness Center, LLC when I joined practices with my husband. My practice is focused on women’s health, such as fertility troubles, pregnancy related conditions, menstrual irregularities, etc. I use a unique combination of acupuncture, powdered herbal formulas that I create myself, flower essences, and therapeutic essential oils. I really enjoy working with women at any stage or transition in their lives. My passion arises from the mysteries of the human body, the observations of qi and how it moves, from my own gratitude of the trust of my patients for sharing their health stories with me. It is the connections and deep relationships that are formed that keep me interested and inspired. 5. Any advice for patients? To take responsibility for your own healing. Health practitioners are here to guide and support but the true progress is made in how you live your life on a daily basis. What habits you form, what kind of stability you can create for yourself. Because I work in the realm of hormones so often I see how a lack of regularity and stability in life habits gets reflected in large hormone fluctuations. We have great power if we can just work on the basics on a daily basis; clean water, and air, adequate sleep, having space for meditation and reflection, circulation of qi and blood through exercise, balanced, fresh food, and having a balance between giving (yang) and receiving (yin) with our precious time. 6.What is your favorite Portland restaurant and why? I really enjoy eating at Kalga Café in SE Portland. All of their dishes are fresh, organic and vegetarian and they have a lot of classic dishes to choose from. I usually judge a restaurant by how the food makes me feel about an hour after eating and I always feel great after eating there. The Oregon College of Oriental Medicine, one of the best TCM colleges, the beautiful surroundings, and friendly people in Oregon brought me here. I like the wisdom of Oriental medicine. It works very well and helps people a lot . I practice at the Healing Sage Acupuncture and Herbal Clinic, in Camas, Washington and also at the Oregon College of Oriental Medicine Acupuncture and Herbal Clinic in South East Portland. I treat many different diseases in my clinic, but my specialties are Gynecology and Oncology. My passion for Chinese medicine comes from the successful treatments I have done for my patients. I am very happy when I solve the problems, which stimulate my thirst of the knowledge of Chinese medicine. I often do both contemporary and classic research for the complicated cases. I gain knowledge and experience from doing that. 5. Any advice for patients? If you want to get the best effect from acupuncture and Chinese herbs, you must be patient as a patient. This means you need get several treatments and give us time to exert our healing skills and talent. 6. What is your favorite Portland restaurant and why? Wang's King is my favorite because it serves real Chinese food, not a modified version. It's just like me in my work as a doctor- I offer pure traditional Chinese medicine, not a modified version. *Dr. Li and her husband Dr. Yufang Xue have also published several research articles within the USA. You can research those articles at pubmed.com. The people, the climate and beauty of the West coast brought my family to Portland. 2. Why did you decide to become an acupuncturist? Kindness and compassion made me a professional of Chinese medicine. Its great treasure and real practice keep me moving forward. Our office is the Healing Sage Acupuncture clinic in Camas, Washington. I have a wide range of types of patients in my clinic, but my specialty is Geriatrics. I also focus on emotion management, pain management and GI disorders. The patients' need for help with disease and illness, and the appreciation of my patients are the sources of my passion for TCM. 5. Do you have any advice for patients? To truly trust in themselves. It is within their own being where they will have the strongest power to cure their diseases and keep themselves healthy. The role of the medical professional is to assist the patient in healing. I am a good cook, and in that way, I can keep my family's diet healthy and balanced when we eat at home. But I also enjoy a variety of foods in different restaurants. I do prefer Chinese dishes, especially those cooked with fresh ingredients. If I have to pick up one favorite restaurant in Portland, I would have to say Wong King's. Dr. Xue has an office with his wife, Dr. Zhenbi Li, LAc, in Camas, Washington. You can check out their website at Healing Sage Acupuncture.com. Sarah Hayes, LAc is a practitioner in North Portland who has a great blog. You can find her site at acupuncturenwpdx.com, and here is a some more insight into Sarah and her practice. I moved to Portland to go to OCOM. It is the best acupuncture school in the country. Moving here also felt like coming home, being a native Northwesterner from Olympia, Washington. I always wanted to be a health care professional and actually I wanted to be an MD. When I was in my 20's I had my first experience with serious chronic pain, I had hip pain that was a horrific. The doctors I went to told me that there was nothing wrong, and that rest and Advil would improve my pain... When it didn't, I ended up turning to acupuncture and my hip pain was resolved in four treatments! I was blown away and so thankful to feel better and have my life back. All I kept thinking to myself was, there must be so many people who have a story similar to mine - people dealing with symptoms that you can live with but don't have to, like pain, fatigue or allergies. Unfortunately most people don't realize they don't have to live with this stuff. In short - I decided I wanted to be a different kind of doctor: I wanted to treat conditions that are not dealt with adequately by Western medicine. I see a vast array of patients in my practice. I treat people in every stage of life, from birth on. We see a variety of conditions. Some of the most common include fertility, pain, allergies, autism, stress, anxiety, depression, addiction, digestive issues, post operative symptoms, and lots of crazy things that come up and for which western medicine just doesn't know how to treat. I practice a variety of styles of acupuncture to accommodate the individual needs of my patients. I do trigger point work, Tan style acupuncture, Traditional Chinese Medicine, and more. What works for one patient is not necessarily going to work for another... Thus I tailor each treatment to the individual. I really get to know my patients. I listen to their stories, ask lots of questions and encourage them to tell me as much as they can about themselves. The more information I have, the better I can treat them. Patients usually come in for 1 or 2 specific complaints and we usually end up watching a handful of symptoms to track their progress and watch as they transform their health. I love what I do because the medicine works so well and people get amazing results. It is an honor to be in people's lives in such an intimate way. Listening to patients stories and watching their lives greatly improve is an incredible way to spend my days. I feel so lucky to facilitate health in a way that is so unique and powerful. I watch people change in ways they never thought were possible. 4. Do you have any advice for patients? I always tell people to listen to their bodies and trust their instincts. We have a lot of information and if we pay attention, our body will tell us what we need to know. I also like to remind people that life is crazy and it is not going to get any easier. No one gets a free pass, we all have stuff, and our job is to figure out how to be graceful within it all. I love Andina, they just do it right. But we go to the New Old Lompoc in Northeast a lot. It is a great place to go with the kids, it is causal and easy. They have a great beet salad and good beer. That's all we need. I wanted to share a few sites with my favorite local and international bloggers with you this week, as there are lot of great people doing great work out there, including practitioners and students. 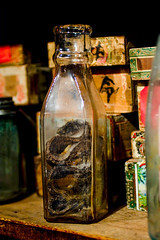 Yael is an LAc who writes chinesemedicinenotes.com has some great posts, including an interview with Dr. Leon Hammer, who made and interesting statement about Chinese Medicine in their interview. Yael also wrote a post with a list of TCM blogs to visit and note. Chinese Medicine Notes a great site with a lot of good information. Another blogger is Eric Gray from deepesthealth.com. Eric is a student here in Portland at NCNM, and the Deepest Health blog has a lot of information on balancing your life in different ways, including the community project, "Year of Sagely Living." One of my favorite posts from Eric is "7 simple ways to be a great student AND not kill yourself during finals week." # 1 " Realize you can’t do it all. It’s hard, I know. This is probably the one thing I have done this term that has saved me despite some setbacks outside of my control. I want to be the best student in the universe. I want to do this while being a great father, partner, small business owner AND save the world while I’m at it." I think this can apply to all of our lives at some point! It's just nice to see it in a blog. Both of these fellow bloggers have a lot of important information for students, practitioners, and people who are genuinely interested learning more about Chinese Medicine. I recommend you check out their blogs as regularly as I do. While living in the Vortex that many call Missoula, Montana, I had a yearning for culture, beauty, color, people and magic. We put out feelers in Seattle, Portland and San Fransisco, and Portland answered! We moved here in 1998 and I have never regretted it. I love Bridgetown and the people that inhabit it. I also enjoy urban living in a city that at the very least attempts to be a good city and in many regards, I think it succeeds admirably! How did you decide to become an LAc? Well, of course, as with any of us that is a very long story. I've been involved in medicine in some form since I was young. I was born at home on the couch and my father will tell you that I've always been very interested in nature, biomedicine and anything having to do with our insides. Right after the birth of my son, I became a Dental Assistant and eventually made my way out of that into Homebirth Midwifery because I wanted MORE. I transitioned out of Midwifery because I wanted to go back to school and have more of a foundation. My plan was to become a N.D., but when I dipped my toe into the great ocean that is Chinese Medicine I was taken, smitten, confused and perplexed into a painfully lifelorn state the led me to the friendly, lovely and eternally supportive Linda Powell's office at the Oregon College of Oriental Medicine. I took a tour that day and after seeing a loving pile of students studying herbs over oolong tea served Gong Fu style, I was hooked. My business is Tensegrity Health Acupuncture (www.tensegrityhealth.com), located within Owls Nest North Collaboration (www.owlsnestnorth.com), at 3615 NE Grand. Owls Nest North is a socially conscious community of health professionals dedicated to providing safe, responsible and affordable treatment to everyone. Our lineup currently is an amazing and vibrant group consisting of mental health professionals, a massage therapist and myself. I am treating patients currently on Monday afternoons and all day on Tuesday, Thursday and Friday. The name of the business comes from the Buckminister Fuller word Tensegrity which, while encompassing many ideas is essentially, "Tensional-Integrity." It refers to the integrity of structures as being based in a synergy between balanced tension and compression components. The human body works in this way with the bones and muscles working in balance with the tension between them. This balance way of looking at life communicates the unity of body and mind that is desperately needed in our society today. I love working with my hands and my practice almost always includes not only acupuncture, but tuina, cupping, guasha and moxa. A typical treatment involves drinking tea while going over the patient's story, what brings them, what concerns they have and just listening to the path that brings them from the beginning to my office. I will then do acupuncture, followed up by the tuina and cupping or guasha. I greatly enjoy working with all types of patients and while I have a good connection with people of all ages, I work especially well with the elderly and with children. My hands. I've always taken in information with my hands, enjoyed life as well as reached for life with my hands. As a midwife, I used my hands to bring forth new life, and now as an acupuncturist I find life, connect with it, move it and encourage it with my hands. One of my closest friends once told me they knew they were an artist when their hands wanted to mould a healed world out of clay. I feel the same way, only my medium is people. It is absolutely vital to my own well being and happiness that I know, do and rejoice in my own Will. Our world is filled with superstition, tyranny and oppression and I have vowed to fight these things with the tools that I have to the best of my ability. Humbly, I hope to approach this great work in the strongest, most balanced and capable way that I know how, and that is with the applied hermetics of Chinese Medicine. Have fun! Most of us spend so much of our time just keeping up, I love to see people relax, let their guard down and have fun. I like my treatments to be light and full of energy and laughter. They should have direct communication via discussion, touch and the needling. Be open! 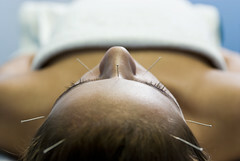 Acupuncture is a totally new experience with completely new sensations. Enjoy it! When is the last time you really jumped head first into something new? What is your favorite Portland restaurant and why? What a difficult question! Portland is FULL of amazing food! My current favs are Navarre, Cassidy's, and Noble Rot. Mmmmm, Creme Brulee! If you'd like to be featured as a Portland Practitioner on the Portland Acupuncture Blog, please contact us directly to arrange an interview.